The NYS DRI program invests $100 million into ten downtown neighborhoods across New York State, providing funds for infrastructure, real estate, and public art capital projects. Downtown Brooklyn was among the communities selected last October that will each receive $10 million from the program. DRI works to transform “downtown neighborhoods into vibrant communities where New Yorkers want to live, work and raise families.” The program provides funds for “much needed critical infrastructure in the Downtown core to create welcoming and safe connections to key assets, ensure equitable and accessible future growth, and improve wellbeing and job opportunities in traditionally underserved communities,” according to ny.gov. Architectural and urban planning firm, WXY Studio, led last week’s discussion, which focused on the western part of the project, from Cadman Plaza West to Navy Street. 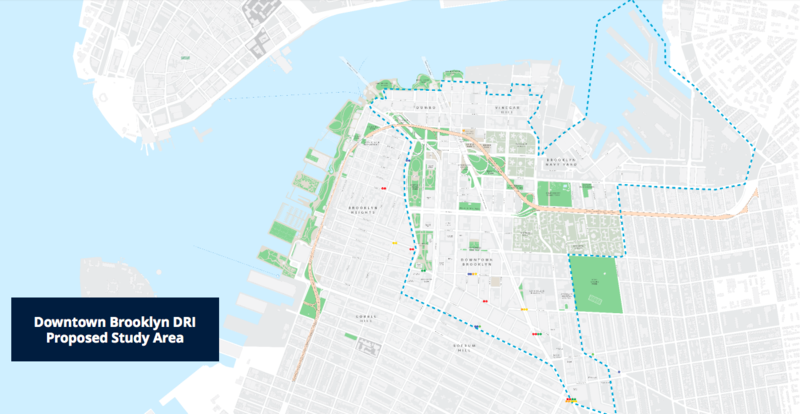 The overall project area spans Downtown Brooklyn, roughly from Cadman Plaza West to the Brooklyn Navy Yard and from John Street to Schermerhorn Street. “We’re looking at public infrastructure projects to improve Downtown Brooklyn,” said Josh Levin, Director of Capital Budget for the Office of Brooklyn Borough President Eric Adams. “Ten million dollars obviously doesn’t go very far in New York City, so we’re looking at about a half a million to two million dollars for six to ten projects,” he explained as to how the funding will be divided. The first community engagement meeting for the Brooklyn DRI took place at the Ingersoll Community Center on December 4. Another public workshop is scheduled for tomorrow, January 23 at the Whitman Public Library from 6pm to 7:30pm. A meeting will be held in March to collect public input on the final selection of proposed projects. “We’re hopeful that we’ll get some great feedback from you so that the Local Planning Committee, which is a 19-member group, can make an informed decision come March,” said Levin. The Local Planning Committee (LPC) will identify and prioritize projects for the DRI plan and establish the vision for Downtown Brooklyn’s revitalization. The LPC is co-chaired by Brooklyn Borough President Eric Adams and Kinda Younes, Executive Director of NYC ITAC, and includes representatives from Downtown Brooklyn Partnership, DUMBO Improvement District, Myrtle Avenue Brooklyn Partnership, Brooklyn Navy Yard Development Corporation, Brooklyn Community Board 2, Downtown Brooklyn Arts Alliance, NYU, the Farragut, Ingersoll, and Whitman Tenants Associations, and more. 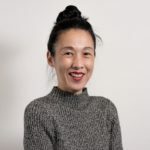 HR&A, the lead consultant on the Brooklyn DRI planning team, along with sub-contractor WXY, will create the final project profiles to present to New York State at the end of March. The goals of the DRI plan are to create active and welcoming public spaces; to strengthen pedestrian and active transportation networks; to provide equitable opportunities for jobs, education, and entrepreneurship; and to enhance access to existing cultural spaces, explained Cara Michell, an Urban Planner at WXY Studio who facilitated one of the two group discussions at Wednesday’s meeting. The two groups shared their feedback at the end of their discussions, noting that insufficient lighting on Cathedral Place and York, Jay, and Sands Streets should be addressed as well as the need for better wayfinding signage for pedestrians and bicyclists at the busy intersection of Flatbush and Tillary. Recommendations were also made to expand Trinity Park and leverage the soon-to-open Wegman’s to help install a track and other upgrades at Commodore Barry Park. Speaking of Commodore Barry Park, Lloyd Rodriguez, coach of the Brooklyn Pitbulls, said that he’s attended all the LPC and Brooklyn DRI community meetings to propose his idea of building a football clubhouse for his youth team at the northeast corner of the park. He brought architectural designs to last week’s meeting which included gallery and community spaces in the one-story, energy-efficient structure. Rodriguez expressed frustration, saying he felt that the LPC wasn’t seriously considering his project idea. Levin explained to Bklyner that Rodriguez’s proposal doesn’t meet the DRI requirement that projects must be “shovel-ready” and able to be implemented within two years. Rodriguez isn’t giving up. He intends to go to upcoming DRI meetings to continue pitching his idea. Visit ny.gov to learn more about the Brooklyn Downtown Revitalization Initiative. 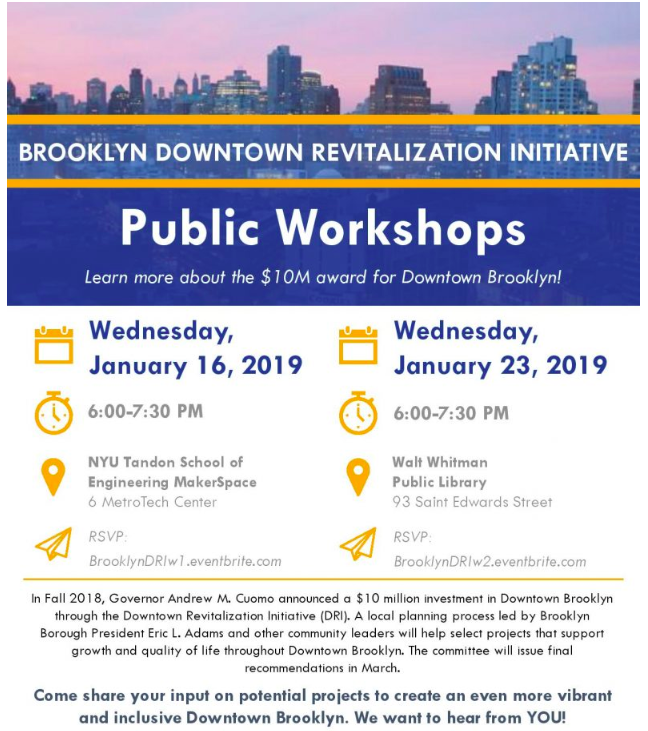 Click here to see the Brooklyn Downtown Revitalization Initiative Local Planning Kickoff presentation from November 2018. If you would like to submit a comment/provide feedback but cannot make it to tomorrow’s meeting, you can email DowntownBrooklynDRI@gmail.com. I find this whole thing a bit strange, from what I can tell, Downtown Brooklyn is already vibrant, especially on Fulton St. Also, aren’t there a **couple** of new buildings going up? What exactly is being “revitalized”?